* Two-pass u-flow configuration utilizing high-flow tubes for up to 40% increase in internal flow rates. * Custom compressed core width to maximize airflow and enhance heat exchange. * Optimized custom 9 FPI (Fins Per Inch) 45 micron copper maximized conductivity. * Yields up to 30% more heat exchange capacity than the Black Ice® GTX240 in ultra-stealth operation (sub-1000rpm fans). * Built-in 15mm deep plenum for equalized core air pressure distribution. * Standard G 1/4" female threaded fittings. 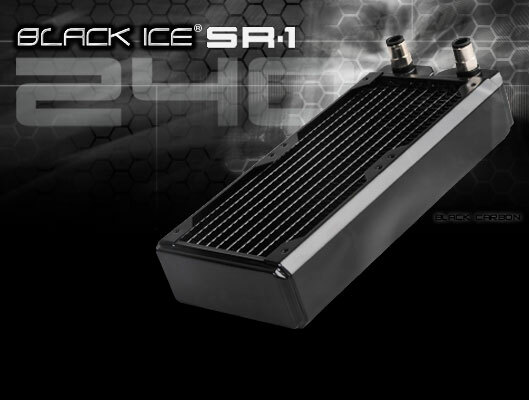 * High performance compact radiator compatible as an upgrade to the Black Ice® Xtreme II, Black Ice® GTX240 and most 2x120mm fan form factor radiators. * Uses 100% Non-corrosive water-soluble fluxing process.